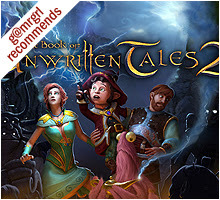 - The game has very detailed instructions. Read them first. - Right click circulates between interactive icons. - You can also manually select the action icons from the right panel. - Depending on the object, you can LOOK AT and/or USE IT / TALK TO IT. - Left click interacts with an object. You will get text-based usage options. - Choosing the wrong answer has no bad consequence. - You get +1 points for looking at various items, even scene decorations. 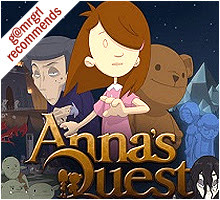 - You get +2 to +8 for correctly interacting with an object / solving a quest. - To get maximum score, first look at, then take/use an object. 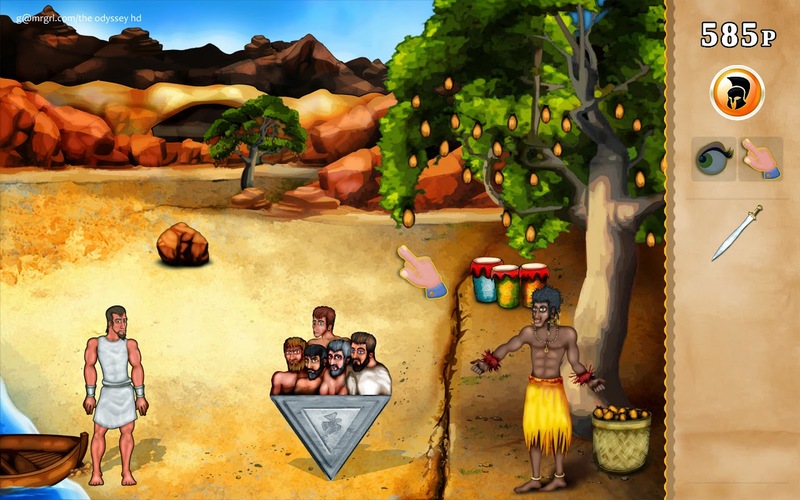 - The score is displayed at the top of the screen. 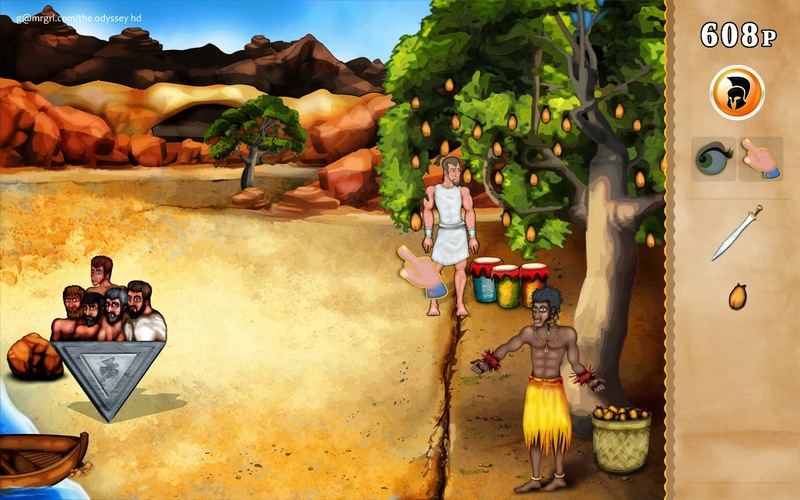 - It is not said what is the maximum possible score for each scene / the game. - The right panel has the inventory, which scrolls up and down. - Right click on inventory objects to LOOK at them. - Inventory objects CAN be combined with each other / dismantled to yield new items. 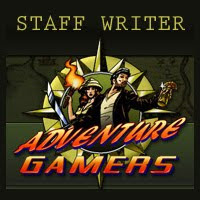 - Click the giant green arrows to exit scenes. LOOK at all objects first to get the +1 scores for each. Even looking at objects YOU have created from inventory items or quest solutions give you +1. 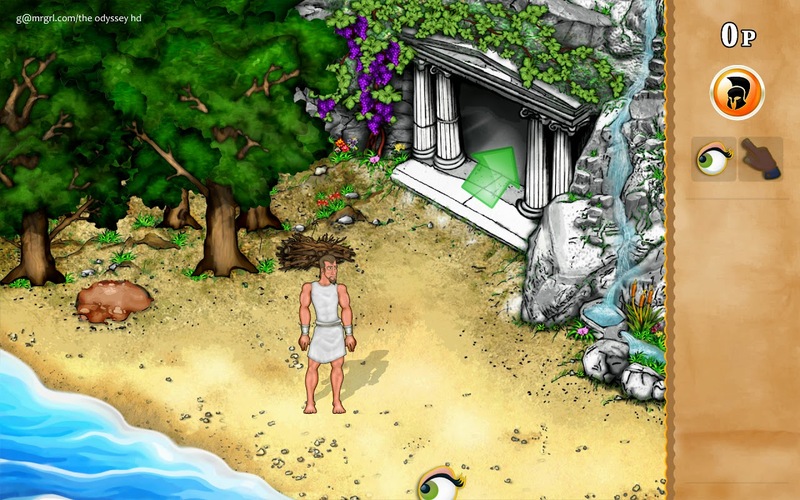 Many non-essential activities like drinking water from Calypso's spring give +1 as well. This walkthrough only considers taking/using/talking activities. MAIN OBJECTIVE: To build a raft and escape the island. TAKE the pile of sticks behind Odysseus. 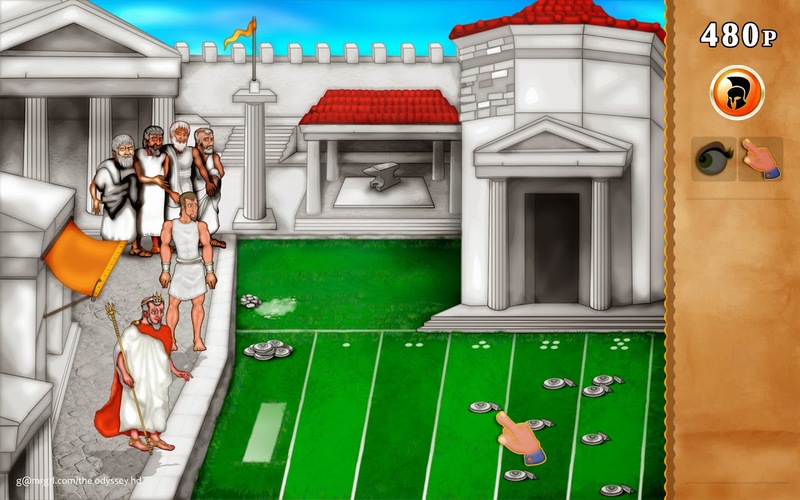 TAKE the mud from the puddle in front of Odysseus. TAKE some grapes from the bower beside the cave entrance. TAKE the tiny branch at the left of the left-most tree (by the sea). EAT some grapes (from the bower) to get +1 extra. DRINK some water from the spring to get +1 extra. LOOK at everything in the room. TALK to Calypso about working the loom. ASK Calypso for a shuttle. A shuttle is automatically added to the inventory. INVENTORY: Use the shuttle with the loom. ASK Calypso about the loom keys: she says to start with one pressed. ASK Calypso about the loom steps: the right one is always loose. USE the seat of the loom the start weaving. TAKE the sail from the loom. TAKE the protective bars from the loom. TAKE the axe from the rear wall. INVENTORY: Use the axe with the sycamore vines on the rear wall. The sycamore vines are added the inventory. INVENTORY: Use the vines with the jug of ambrosia on the table to make rope. TAKE the flint stones from the right of the brown amphora at the rear. INVENTORY: Put the sticks (wood) into the furnace at bottom right. INVENTORY: Use the flint with the wood / furnace to light a fire. INVENTORY: Put the mud in the container in front of the furnace. USE the mud / clay in the container to make a water container. TAKE some more mud from the puddle. INVENTORY: Use the water container with the water hole at right to fill it. A filled water container is added to the inventory. USE the mud in the container to make a food container. INVENTORY: Use the food container with the fruits on the table. Go outside, get some more mud from the mud pit. USE the mud in the container to make a water container. INVENTORY: Use the grapes with the empty (new) water container. INVENTORY: Use the grapes + container with Calypso. Wine is added to the inventory. INVENTORY: Use the axe with the exposed branch of the front tree. INVENTORY: Use the tiny branch with the broken axe. A fixed axe is added to the inventory. Two long sticks for the mast are added to the inventory. INVENTORY: Use the axe with the right branch of the left-most tree. Two smaller sticks for the raft are added to the inventory. INVENTORY: Use the axe with the branches at rear top left. A pile of logs is added to the inventory. LOOK at the sandy beach. It's perfect to make a raft on. 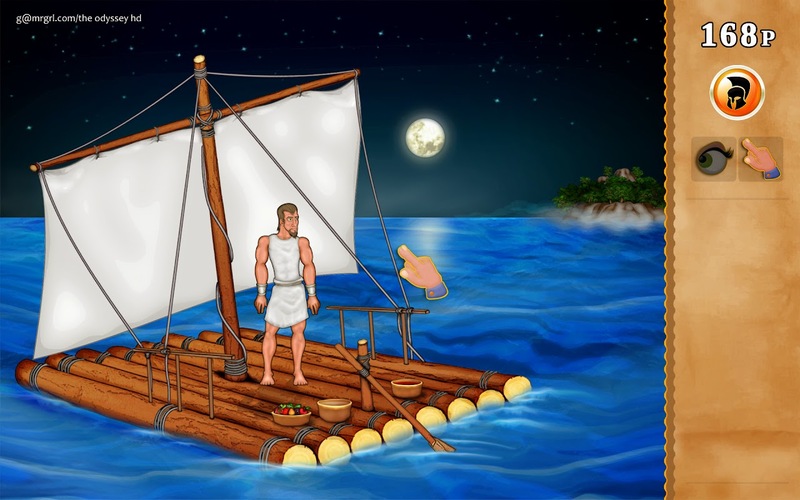 But Odysseus does not know HOW to make a raft yet. INVENTORY: Use the pile of wood with Calypso. She tells how to build a raft. INVENTORY: Use the axe with the sand. INVENTORY: Use the pile of wood with the ditches. INVENTORY: Use the pile of wood again with the three logs. 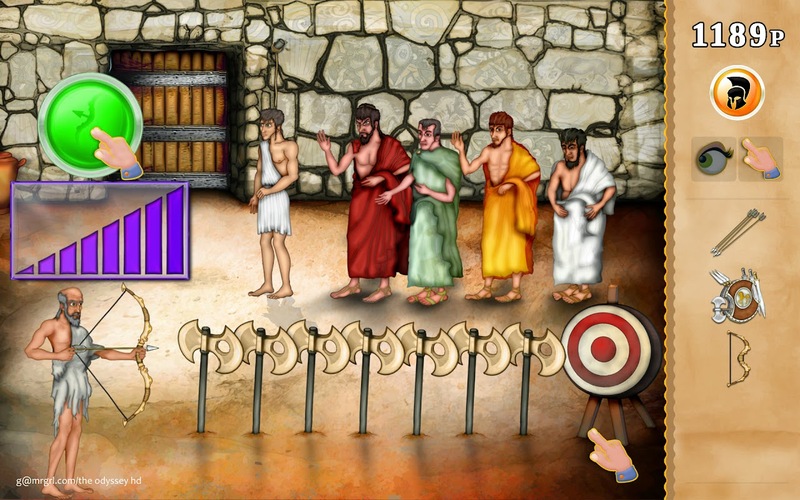 Odysseus automatically uses the rope to bind the logs. 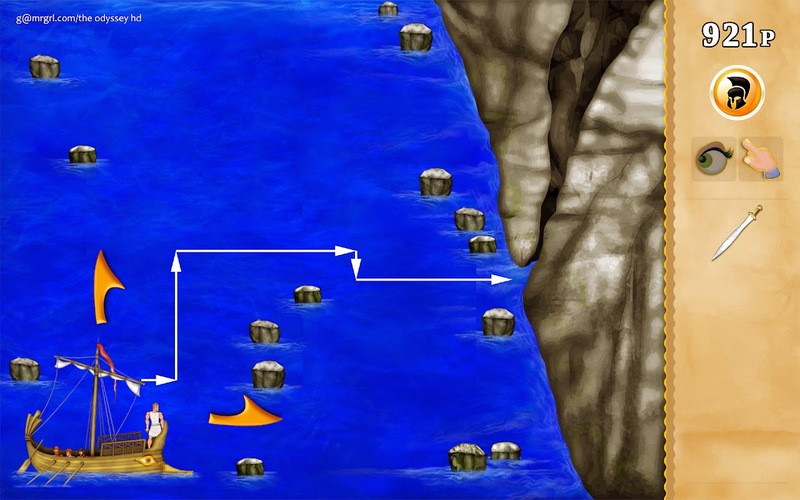 INVENTORY: Use the two mast logs with the raft. INVENTORY: Use the sail with the mast. 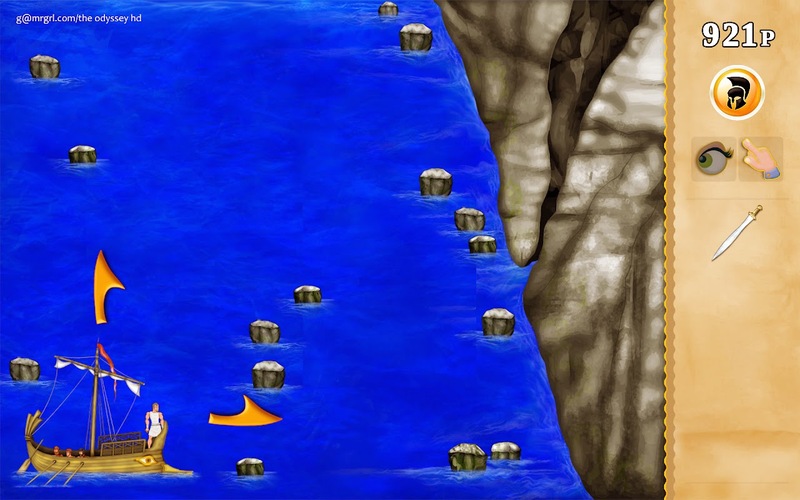 INVENTORY: Use the protective bars with the raft. INVENTORY: Use the rope with the raft. INVENTORY: Use the rope with the two smallish logs. The wheel is now ready. INVENTORY: Use the wheel with the raft. INVENTORY: Use the water container with the raft. INVENTORY: Use the wine container with the raft. INVENTORY: Use the food container with the raft. TALK to Calypso. Automatically say goodbye. Automatically exit to next segment. MAIN OBJECTIVE: To get Odysseus to Ithaca, his home. First, to save Odysseus from hypothermia. Odysseus is stuck with slack sails and no sense of direction. The left protective bar is cracked. KICK the left bar to break it. A piece of wood is added to the inventory. Left rope: Pull it just enough. Right rope: Pull it very hard. 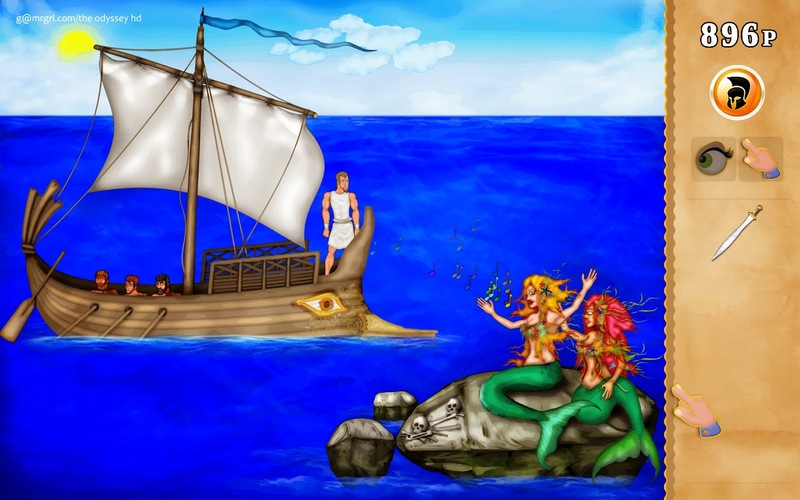 CLICK on Ogygia, Calypso's island. WONDER if the Goddess will help you. A fish is added to the food bowl on the raft. INVENTORY: Use the fish with the sea. "Should you find the north, follow the asterism of Vowtis. It's between Ophiouchus and Scorpio. Bear that in mind, or you will get lost." CLICK the wheel to turn the raft. INVENTORY: Use the stick with the wheel. The bird flies off. 14 asterisms are added to the inventory. Click on each collection of stars to get a description of it. INVENTORY: Click each asterism with the raft to get the pattern of stars on it. Match the description of the star-groups to the star patterns on the asterism stones. Click an asterism to its group of stars. Click between the Ophiouchus and Scorpio asterisms to navigate the ship. MAIN OBJECTIVE: To meet the Phaeacian king. TAKE the stones from the right of the bush. INVENTORY: Use a stone with the ball. The ball goes into the river. TAKE the two logs near the forest. INVENTORY: Use the two logs with the chariot. TAKE the branch of the tree just to the right of the bridge. TAKE the wedge-shaped stone in the middle of the bridge. INVENTORY: Use the branch with the blade stuck in the tree trunk. INVENTORY: Use the wedge-shaped stone with the blade in the tree trunk. The blade is added to the inventory. INVENTORY: Use the blade with the broken chariot wheel. TAKE the glassy vase amid the flowers on the other side of the river. INVENTORY: Use the glassy vase with the river to fill it. TAKE the dry branches beside the woodpile on the other side of the river. INVENTORY: Use the dry branches with the woodpile. INVENTORY: Use the water-filled glassy vase with the woodpile. INVENTORY: Use the broken chariot wheel with the fire. EXIT left to the outskirts of the city. Note the wooden stick in the bush at bottom right. TAKE the stick when the guard is looking to the left. EXIT right to the river. INVENTORY: Use the stick with the ball to get it from the river. INVENTORY: Use the stick with the hot chariot wheel. INVENTORY: Use the stick + hot chariot wheel with the river. INVENTORY: Use the fixed wheel with the chariot. INVENTORY: Use the wedge-shaped stone with the fixed wheel. TALK to Nausicaa. Clean up automatically. TALK to the guard. He lets Odysseus in. TALK to the boat worker. TALK to the young girl (Athena). Odysseus needs to be invisible to see the king - using godly tea. TAKE the mint from beside the wall at right. UNTIE the boat at the jetty. TELL the worker the boat is untied. TAKE the bowl of breads from the statue. INVENTORY: Use the bowl of breads with Odysseus. Bread and bowl are separated in the inventory. INVENTORY: Use the breads with the boat worker. CLICK the woodpile in front of the worker. Ask him to make a fire. CLICK the square piece of wood plank of the boat's body. TAKE the knife (hidden underneath the wood plank). INVENTORY: Use the knife with the rope hanging beside the worker. INVENTORY: Use the rope with the trident of Poseidon's statue. CLICK the rope. The trident moves. The guard is distracted. INVENTORY: Use the knife with the sail of the smaller boat at the dock. (Do the above step quickly before the guard fixes the trident). Once more! CLICK the rope. The trident moves. The guard is distracted. TAKE the blower / bellows at the left of the guard. INVENTORY: Use the bellows with the fire. INVENTORY: Use the bowl with the mould on the Poseidon head. INVENTORY: Use the mint leaves with the bowl+mould. INVENTORY: Use the piece of sail with the bowl. INVENTORY: Use the bowl with the river. Now the tea is ready to be brewed. INVENTORY: Use the tea-bowl with the fire. INVENTORY: Use the tea with Athena. EXIT automatically to the palace. MAIN OBJECTIVE: To convince King Alcinous for passage to Ithaca. 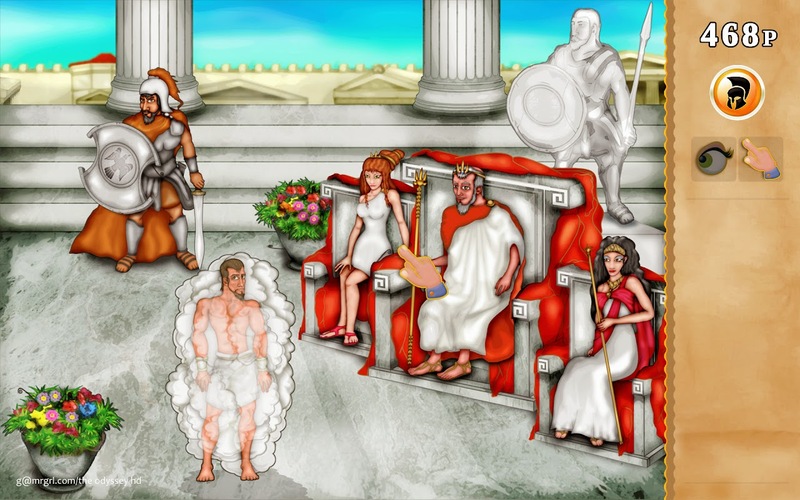 Odysseus has to remove the godly mist. TOUCH the guard with shield. His arm is getting weary. TOUCH the shield. Push it down gently. TOUCH the guard again. Mimic the king and tell him to put his shield down. EXIT automatically to the next day. Odysseus has to win the discuss-throwing competition. 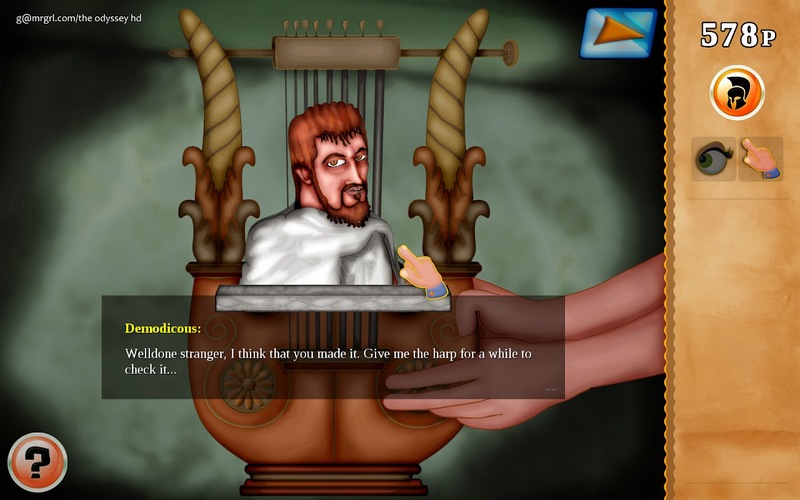 Odysseus has to find seven lyre chords. TAKE the chord of the lyre from the orange roof-cover at left. TAKE the chord of the lyre from under the old men's feet. TAKE the chord of the lyre from the red-tiled roof of the middle building. TAKE a stone from the pile on the field. TAKE a slanting (ill-shaped) discuss from the pile on the field. INVENTORY: Use the stone with the shaky top wall of the right-side building. A stone breaks off and falls to the ground. INVENTORY: Use the slanting discuss with the place where the stone fell. TAKE another stone from the pile on the field. Another stone breaks off and falls on the discuss. INVENTORY: Use the discuss with the chalk on the white spot beside the stone pile. STAND on the wide white line on the left of the field. Note the flag flying at rear top. The discuss should be thrown when the flag flies HARD, to the RIGHT. When the flag is ready, CLICK the discuss (anywhere) on the field to throw it. TALK to Nausicaa. Ask for the lyre chord. TAKE the lyre chord stuck under the vase beside Nausicaa. TAKE the lyre chord stuck in the flowers at bottom left. TAKE the lyre chord stuck in the guard's belt. TALK to Demodicous. Ask for his lyre. INVENTORY: Combine all the lyre chords with the lyre. INVENTORY: Use the lyre with Odysseus to tune it. Each string has two sounds: tight and loose. Listen to the correct sounds as they play from left to right. Tighten or loosen each string till the lyre is tuned. MAIN OBJECTIVE: Rescue the drugged crew. TAKE a lotus fruit from the basket. 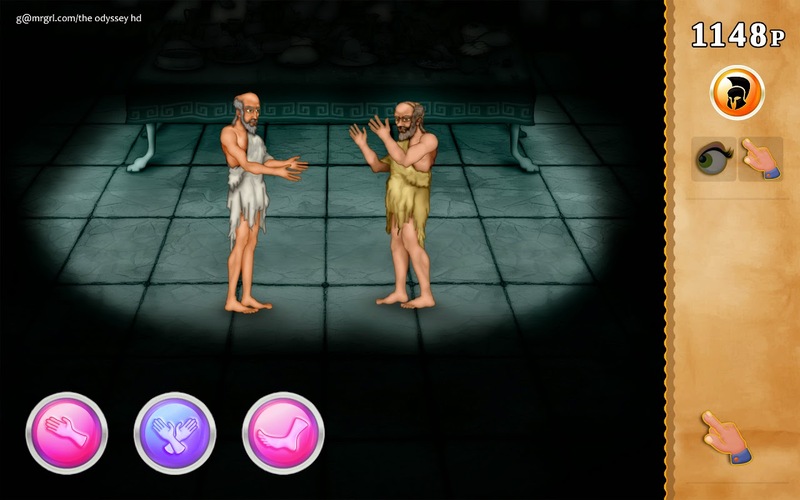 Odysseus has to play the three dance music to move his companions to the boat. CLICK the drums to select which music to play. CLICK the rock to place it so as to prevent the crew from moving upwards. This can be solved in many ways. Most often, play the Souba as it moves the crew downward. If the rock gets hidden behind the crew, CLICK the crew and select last option. CLICK HERE for the second last move - then play Souba. EXIT automatically to the journey. MAIN OBJECTIVE: Escape the cave. 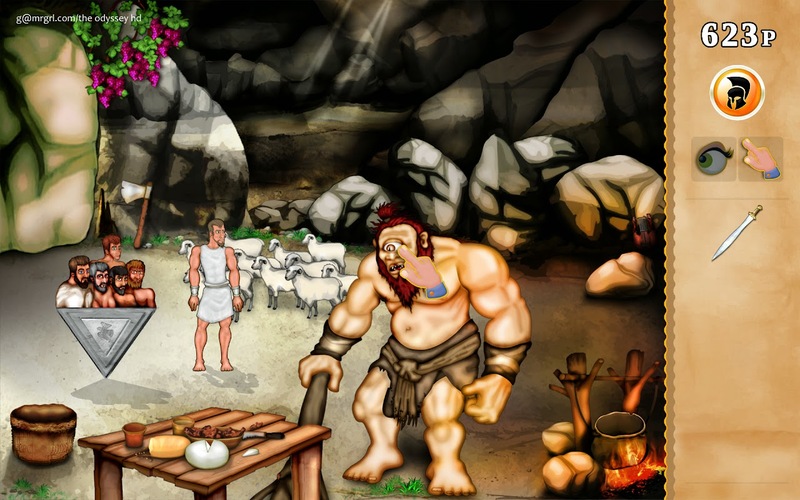 TAKE the food / TALK to the crew: either way, Odysseus will wait for the Cyclops. INVENTORY: Use the sword with the grapes near the door. TAKE the earthenware glass from the table. INVENTORY: Put the grapes in between the middle two sharp-tipped boulders. INVENTORY: Put the glass at the base of the two sharp-tipped boulders. TALK to the crew about stepping on the grapes. They get on the rock. TELL the crew to step on the grapes. TAKE the glass with wine. INVENTORY: Give the wine to the Cyclops. REPEAT the entire process to make another glass of wine. TALK to the Cyclops about singing for him. TAKE the lyre from rear right. TELL the crew to return to their positions. INVENTORY: Give the lyre to the crew. TELL the crew to lift the club. CLICK the club; lift at the same time as the crew. TAKE some grass beside the fire. INVENTORY: Use the axe with the club to sharpen its end. INVENTORY: Use the sharpened club with the fire to harden it. TELL the crew to get on the rock behind the Cyclops's head. 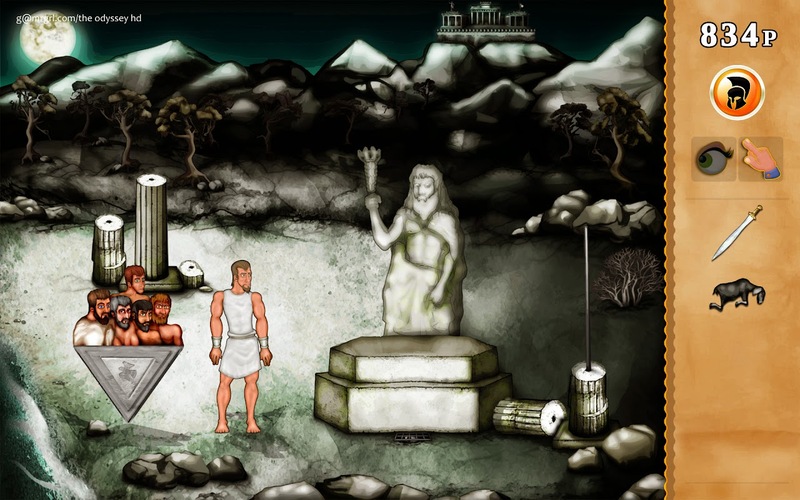 CLIMB UP onto the rock behind the Cyclops' head. INVENTORY: Together, use the sharp club to blind Polyphemus. INVENTORY: Use the grass with the sheep. HIDE behind the sheep; encourage crew to do the same. MAIN OBJECTIVE: Find a way to Ithaca. TAKE the wooden spear beside the closet. TALK to Aeolus. He wants his golden whistle. The whistle is in the sea at the front left of the platform. Odysseus needs to open the closet. CLICK the left lever to set the Wind Direction to WEST. Click the right lever to set the Weather Condition to BAD weather. PRESS the red button on the console. The weather display can be fast-forwarded using the button at bottom right. TAKE the dip-net from the open closet. INVENTORY: Use the wooden spear with the dip-net to extend it. INVENTORY: Use the longer dip-net with the whistle. INVENTORY: Use the whistle with Aeolus. Odysseus needs the West Wind to go to Ithaca. All winds except the West Wind must be trapped. CLICK the control panel to set it to find either the North, East or South Wind. 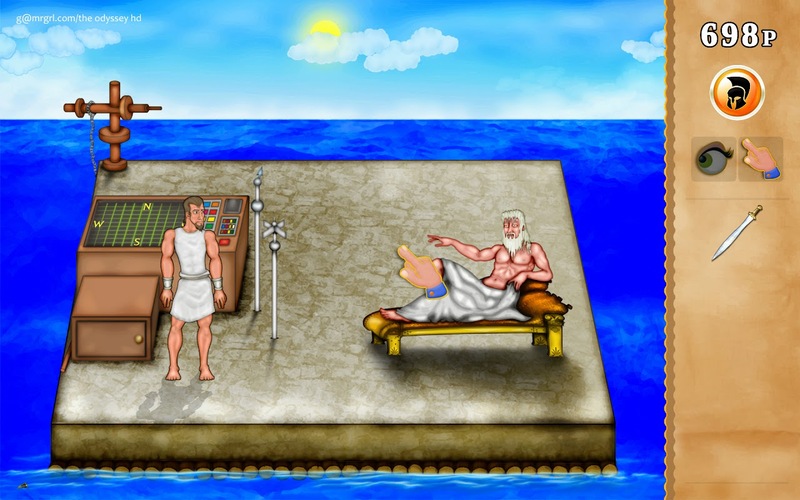 Odysseus has to position the platform so that the wind is at the centre of the grid. SET the weather condition via the right lever: BAD for North Wind, FINE for South and East Winds. SET the left lever at North Wind to move the platform up (wind on screen moves down). SET the left lever at East Wind to move the platform right (wind on screen moves left). SET the left lever at South Wind to move the platform down (wind on screen moves up). SET the left lever at West Wind to move the platform left (wind on screen moves right). PUSH the red button on the control panel to get a gust of wind. USE the dip-net to CLICK ON and capture the wind. This is tricky; you have to move fast and be accurate. REPEAT process for all three winds. INVENTORY: Give the three winds to Aeolus. MAIN OBJECTIVE: To escape with crew. "Drop into boiling water: something lucky, something anti-oxidant, something greasy, and a harmless mite. When the broth turns into green, we are ready!" TAKE some firewood from the left bottom shelf. TAKE a long straight branch from right bottom shelf. TAKE a random branch from right bottom shelf. TAKE a pile of branches from right bottom shelf. TAKE a candle from the table. INVENTORY: Use the firewood below the pot. INVENTORY: Use the pile of branches BELOW the firewood. INVENTORY: Use the candle with the oil lamp at rear right. USE the earthenware jar of water at right with the pot. INVENTORY: Use the lit candle with the firewood. TAKE the hare-foot from the top right shelf (something lucky). TAKE the tea leaves from the middle left shelf (something anti-oxidant). TAKE the olive root from the top left shelf (something greasy). TAKE the grey spider from the middle right shelf (a harmless mite). INVENTORY: Add the hare-foot, tea leaves, olive root and grey spider to the pot. TAKE a dipper of tonic out of the pot. INVENTORY: Use the tonic with the crew. They drink it and... oops! After cutscene, back to Circe's room. INVENTORY: Swap Circe's wand with the long straight branch. INVENTORY: Put the Moly herb Hermes gave into the pot. NUDGE Circe to wake her up. INVENTORY: Use the tonic with Odysseus. 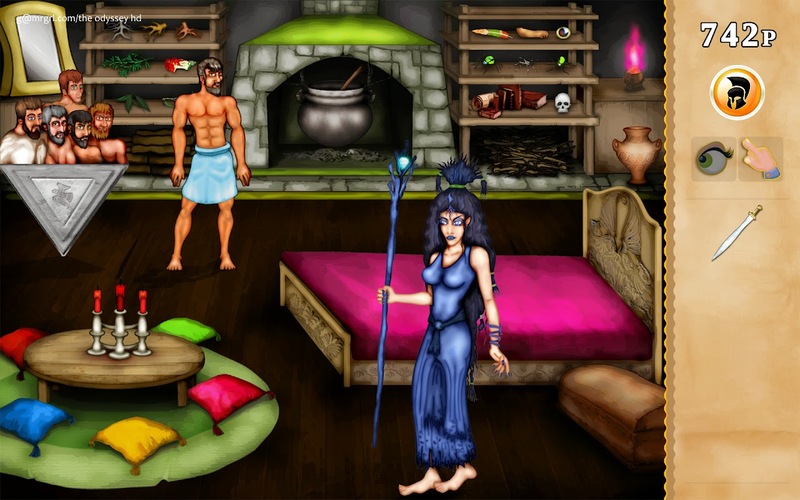 TALK to Circe about sleeping with her - if she turns your crew back into men. MAIN OBJECTIVE: To consult with the dead. TAKE the small piece of marble beside the two pillars at left. TAKE a piece of the dead bush at right. INVENTORY: Use the dead bush with the tiny (broken) marble pillar at left. INVENTORY: Use the piece of marble with the tiny marble pillar. The burning bush is added to the inventory. INVENTORY: Use the burning bush with the torch of the statue. TAKE the metal bar from the broken pillar at right. INVENTORY: Use the metal bar with the grate at the base of the statue. TAKE the metal circular hoop from inside the grate. INVENTORY: Use the metal hoop with the metal bar. INVENTORY: Put the metal bar + hoop on the tallest pillar at left. INVENTORY: Put the unconscious sheep on the altar of the statue. The dead spirits are here to steal the sheep! For each spirit, CLICK the sword in the inventory, then CLICK the spirit. 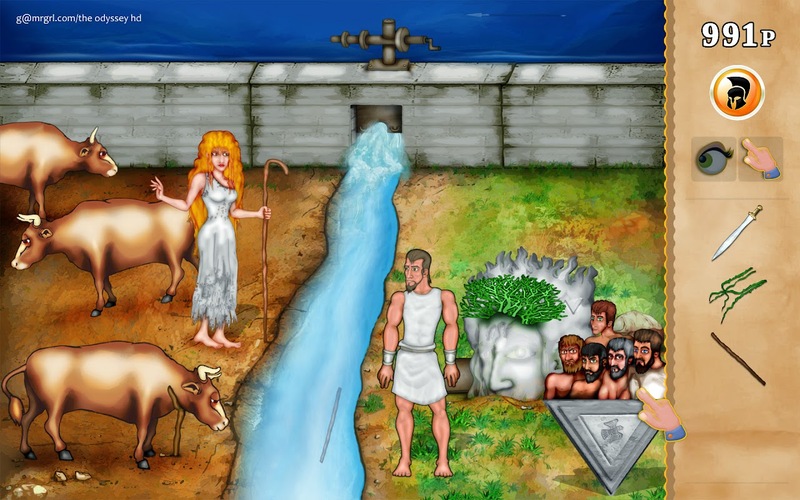 There are four spirits to fend off, including Odysseus's mother. It's a pretty simple segment. TALK to the spirit of Teiresias, and Mother. MAIN OBJECTIVE: To escape the Sirens. This is a timed segment as the ship keeps moving towards the sirens. CLICK the sail to lower it and reduce ship speed. TAKE the oar at left. TAKE the rope from the mast. INVENTORY: Use the oar with the wax on the ship's prow at right. INVENTORY: Use the oar+wax with Odysseus to collect the wax. INVENTORY: Use the wax with the crew. INVENTORY: Use the rope with Odysseus - ask the crew to tie him up. MAIN OBJECTIVE: To make it safely through the rocks. This is a timed segment as the ship keeps moving towards the rocks. CLICK the yellow arrows to navigate the ship. Timing has to be correct to pass through the rocks while open. The easiest strategy is to move up towards the middle, then go towards the rocks horizontally, speeding up once you are ready to rush through the open rocks. CLICK HERE for a sample route. MAIN OBJECTIVE: To escape the monster and the whirlpool. This is a time segment as the ship keeps moving towards the whirlpool. 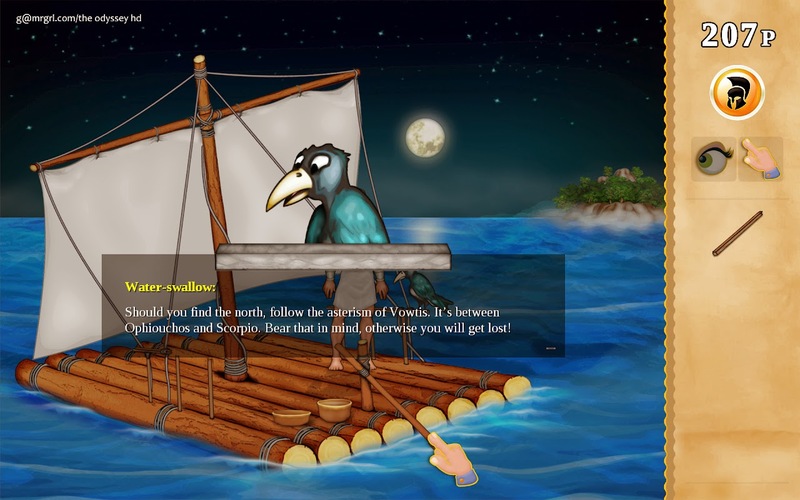 CLICK the sail to lower it so the ship is too fast for Scylla to catch. TAKE the anchor at the left of the ship. TAKE the rope at the middle of the ship. INVENTORY: Use the rope with the anchor. 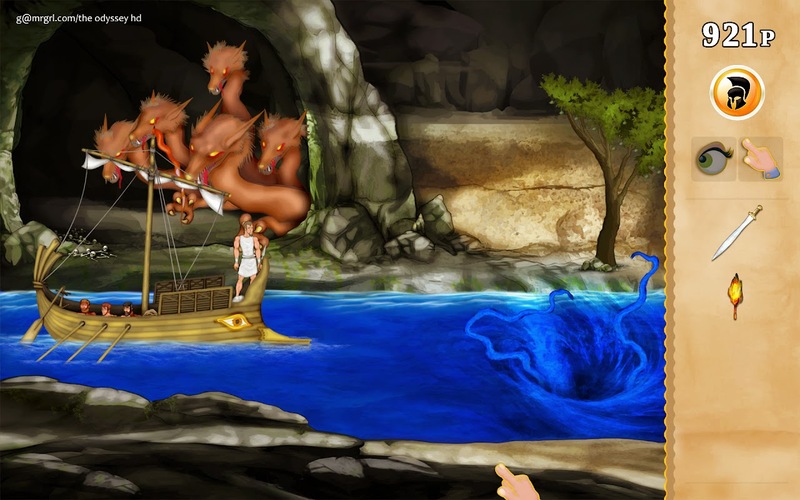 INVENTORY: Throw the roped anchor to the rocks at the right of Scylla's cave. The ship is now anchored. TAKE the extra sail from the ship. TAKE the spear at the right of the ship. INVENTORY: Use the spear with the tree. TAKE an exotic fruit from the ground. INVENTORY: Use the spear with the extra sail. INVENTORY: Use the torch with the spear+sail to make an extended torch. INVENTORY: Use the extended torch with the Scylla. TAKE the axe in front of the cave. INVENTORY: Use the axe with the tree. INVENTORY: Use the fruit with the Charybdis. INVENTORY: Use the sword with the tentacle of Charybdis. TAKE the anchor at the middle of the ship - time to go! MAIN OBJECTIVE: To find some food. TAKE the stick from the water. Another appears. Collect all three. INVENTORY: Use the sword to cut the vines on Helios's statue. INVENTORY: Use the vines with the sticks to make a ladder. INVENTORY: Use the ladder with the wall. TAKE the wooden plank beside the statue. TAKE some greens from the ground in front of the statue. CLICK the ladder to climb onto the wall (dam). INVENTORY: Use the ladder on the other side. INVENTORY: Use the greens with the sick cow at the bottom. TAKE the forked stick when the cow pulls its head out. This is a timed segment that demands accurate clicking. If you miss it, get more greens from the other side. Very tedious! CLICK the ladder to climb onto the wall. INVENTORY: Use the forked stick with the dam mechanism to jam it. The spear floating in the water beyond the dam comes closer. INVENTORY: Use the spear with the poisonous vine on the statue. Note the code on the statue: PHAETHON. TALK to Lampetie about stick. TELL her the correct code. The hooked stick is added to the inventory. 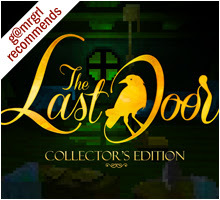 INVENTORY: Use the hooked stick with the dam door to shut it. INVENTORY: Use the wooden plank on the now-trickling stream. MAIN OBJECTIVE: To make plans with Eumaeus. Odysseus is surrounded by dogs. 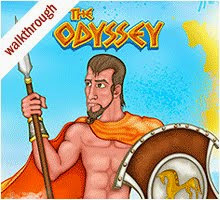 CLICK on Odysseus to move up slowly. Repeat once more. TAKE some pig food from the sack. INVENTORY: Use the pig food with the dogs. 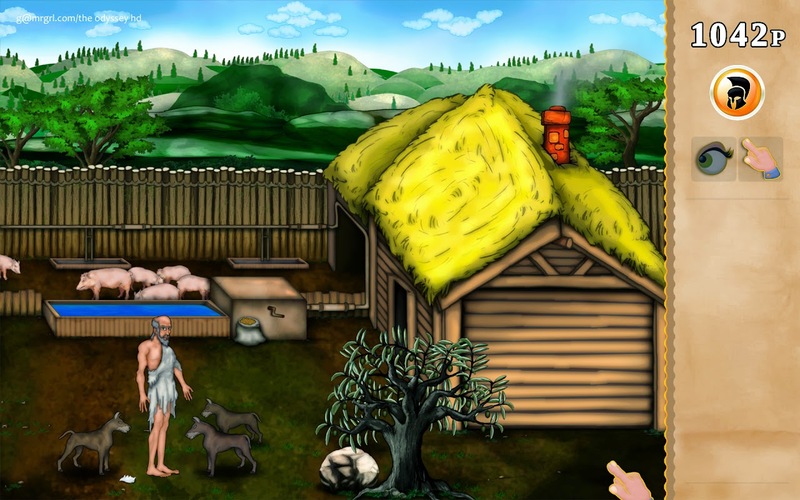 Odysseus has to fix the pig-feeding machine. TAKE the torn scrap of cloth from the ground. TAKE the sack of pig food. TAKE the crank from the machine. INVENTORY: Use the crank to beat the olive tree. COLLECT all the olives fallen on the ground. INVENTORY: Use the olives with the scrap of cloth. INVENTORY: Use olives+cloth with the big rock. INVENTORY: Use the greasy cloth with the hole in the feeding machine. INVENTORY: Use the crank with the feeding machine. INVENTORY: Use the sack of pig food with the machine. TAKE the empty cup on the table. INVENTORY: Use the empty cup with the jar of flour at right. INVENTORY: Use the cup+flour with the water trough outside. INVENTORY: Use cup+flour+water with Odysseus to make dough. INVENTORY: Use the dough with the jar of wine. INVENTORY: Use the empty cup with the jar of wine. INVENTORY: Use the cup of wine with the table / Eumaeus. EXIT automatically to the dining room. MAIN OBJECTIVE: To get in touch with Penelope. 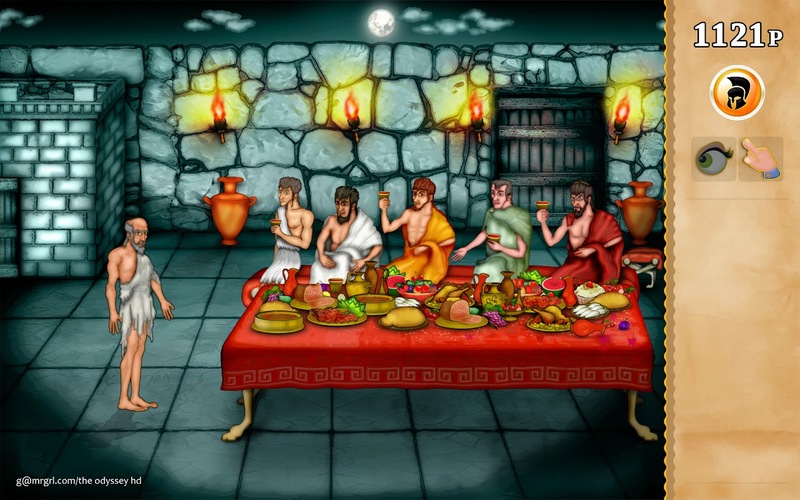 ASK Telemachus for some food. ASK all the suitors for food. 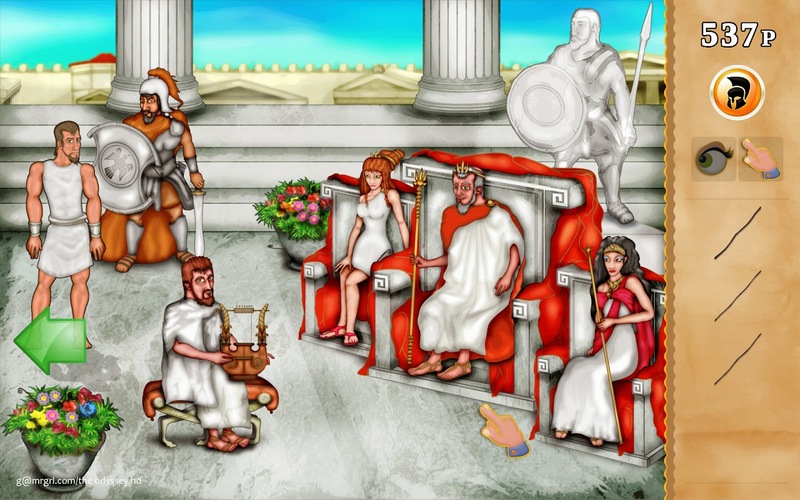 Everyone except Antinous gives food. ASK Antinous again for food. The footstool is added to the inventory. INVENTORY: Put the footstool at the head of the table. 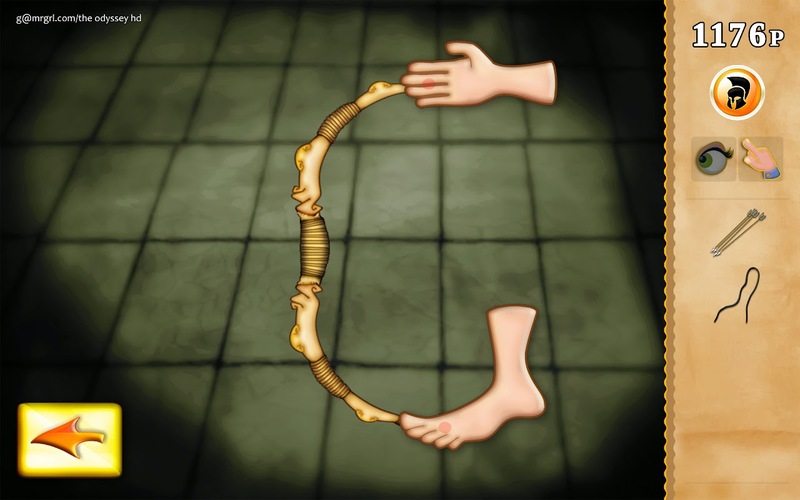 The foot and hand icons attack. The two-hand icon defends. Whoever gets three hits first wins. It's a simple arcade game. Attack when Tros's hands are down. Kick if he is far. Punch if he is near. Block when he attacks. EXIT automatically to next day. MAIN OBJECTIVE: To defeat the suitors. TAKE the bow from the ground at left. TAKE the weapons beside the door. Note the rope holding the door up. 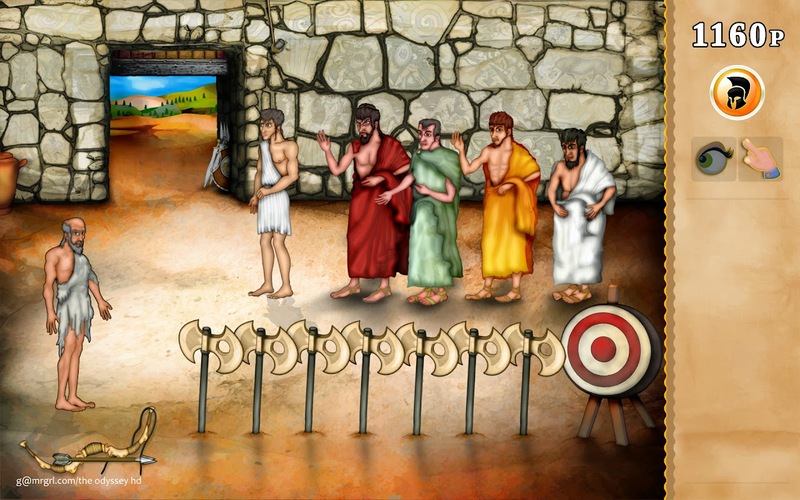 Odysseus has to cut the rope without alerting the suitors. INVENTORY: Use the bow with Odysseus. Use the string on the bow. Connect it from the top of the bow, to the middle. Now arrows will arch upwards. EXIT to the arena using the button at bottom left. INVENTORY: Use the wrongly-strung bow with the target. Point it at the rope. INVENTORY: Use the bow on Odysseus. The bow has to be bent enough to string it. Use the hand and the foot to bend the bow. The red dots mark the points of contact of hand / foot with the bow. INVENTORY: Use the bow with the target. 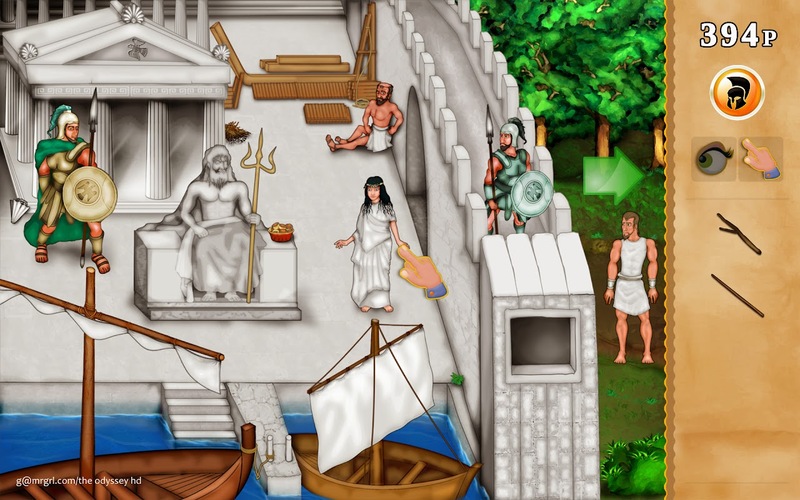 Use the up and down arrows to control Odysseus's position. Move him down so the arrow is aligned with the holes in the axes. Now keep the green button pressed till maximum power. The arrow should hit the bull's-eye.